Omega’s are good for your joints, skin, vision, brain, and heart. They help lower bad cholesterol levels and even boost fertility. They’re also an ‘anti-ager’ and an ‘anti-inflammatory’. They’re found naturally in a variety of delicious foods including walnuts, salmon, tuna, olive oil and avocados. It’s time you got to know the daily dose that’s good for just about every single part of your body. Some fatty acids — called essential fatty acids (EFAs) — are needed in our diets, because our body can’t produce them. To stay healthy, we must obtain these fatty acids from our food or by supplementation. Did You Know that Omega’s are Extremely Good for your Eye Health? Approximately 9 million people in the U.S. have age-related macular degeneration with 1.75 million having significant vision loss from the advanced form of the disease. Why Omega 3’s for Your Eyes? Dietary fat is an important source of energy and a necessary part of the human diet. Fatty acids, a component of fat molecules, are important in keeping our eyes healthy. DHA is found in the highest concentration in the retina, suggesting it has an important function there. EPA is used in the production of DHA in the body. Dry eye syndrome also has been linked to omega-3 deficiency. Additionally, low levels of DHA and EPA have been associated with diabetic retinopathy, age-related macular degeneration (AMD) and retinopathy of prematurity. EPA and DHA are concentrated in fatty fish and other seafood. In addition, you can take omega-3 fatty acid supplements in oil or capsule form. DHA and other omega-3 fatty acids are found in maternal breast milk and also are Omega-3 supplemental formulas appear to stimulate vision development in infants. According to many studies at Harvard School of Public Health and published in the journal Pediatrics, the researchers discovered that pre-term infants who were given formula that was supplemented with DHA showed significantly better visual acuity when they were 2 and 4 months old in comparison to similar pre-term infants who were not given formulas that included omega-3 DHA supplement. In 2007, a team of researchers published a study, led by Lois Smith, M.D., Ph.D., professor of ophthalmology at Harvard Medical School, Children’s Hospital Boston, that suggested omega-3 fatty acids, such as eicosapentaenoic acid (EPA) and docosahexaenoic acid (DHA), may prevent these diseases. Now Dr. Smith and colleagues show that a byproduct of DHA, called 4-hydroxy-docosahexaenoic acid (4-HDHA), may be the chemical that prevents neovascularization in the retina. Researchers Learn How Certain Omega-3 Fatty Acids May Halt Vision-robbing Blood Vessel Growth in the Retina by conducting trials in mice. Once eaten, omega-3 fatty acids are converted to healthy by products by molecules called enzymes. Each enzyme converts omega-3 fatty acids into a different byproduct. In this study, the investigators searched for the specific byproduct that prevents neovascularization by performing experiments on a variety of mice, each engineered to lack one or more of the enzymes known to convert omega-3 fatty acids into byproducts. Each mouse was fed omega-3 fatty acids and then exposed to high levels of oxygen. Abnormal blood vessel growth occurred in only one mouse. This mouse lacked the enzyme called 5-lipoxygenase (5-LOX), which normally converts DHA into 4-HDHA. These results indicate that 5-LOX is the enzyme responsible for converting DHA into the anti-neovascular byproduct 4-HDHA. Interestingly, the researchers found that the conversion of DHA into 4-HDHA did not occur in the retinas of the mice tested, which normally contain lots of DHA. Instead their results suggest that the conversion may occur in immune cells, called leukocytes, which circulate throughout the blood. The researchers showed that human leukocytes can also convert DHA to 4-HDHA, suggesting they may also protect human retinas from neovascularization. Which Omega 3’s Should You Use? 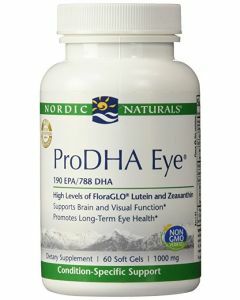 We recommend Nordic Naturals Pro DHA Eye. They make exceptionally high quality fish oils to maximize absorption and results. This formula is considered to support the development and maintenance of eye tissue. It encourages healthy vision and the moisture of the tissue.